The US is "closely and carefully" the month-long border standoff between China and India, the Trump administration said Friday, urging the two Asian giants to engage in direct dialogue to reduce the tension. "This is a situation that we are following closely and carefully. I'd have to refer you to the governments of India and China for more information on that," State Department spokesman Heather Nauert told reporters. Earlier, Gary Ross, a Defense Department spokesman, was quoted by the Press Trust of India (PTI) as saying "We encourage India and China to engage in direct dialogue aimed at reducing tensions and free of any coercive aspects." Mr. Ross, however, refused to take sides on the issue, the PTI said adding: "We refer you to the governments of India and China for further information... We are not going to speculate on such matters," Mr. Ross said when asked if the Pentagon fears the tension may escalate between India and China. The U.S. State Department too has made similar statements over the past week, the PTI said. Not surprisingly, the Global Times, the mouthpiece of the Chinese Communist Party, Friday issued another warning that if India doesn't withdraw its forces from Doklam, China may get prepared for a military confrontation and resolve the conflict through non-diplomatic means. The Paper reminded India as to how it had underestimated Beijing in 1962 and cautioned not to repeat the 'same mistake'. Global Times' strongly-worded editorial came a day after Indian Foreign Minister Sushma Swaraj told the Parliament that there was no question of pulling Indian forces back from the Doklam territory unless China does the same. Swaraj also stated that all other countries support India's stand on the current stand-off. However, Global Times writes that, "She (Sushma Swaraj) was lying to the parliament." Global Times said: "First, India's invasion of Chinese territory is a plain fact. New Delhi's impetuous action stuns the international community. No other country will support India's aggression. Second, India's military strength is far behind that of China. If the conflict between China and India escalates to the intensity where their row has to be resolved through military means, India will surely lose." The editorial said: "India should abandon the fantasy of a long-term standoff at Doklam. China will by no means agree to the withdrawal of troops from both sides in order for talks to be held. 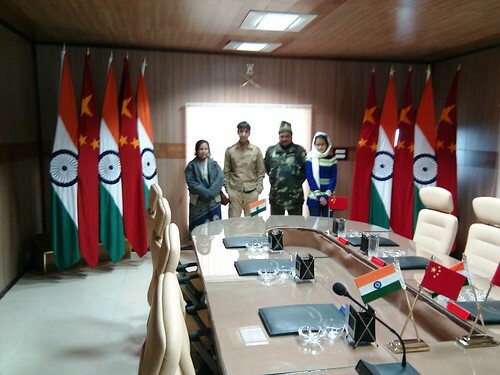 Doklam is Chinese territory. "The withdrawal of Indian troops must be a precondition for talks and China will not compromise on this stance," the Global Times said adding: "If Indian troops continue trespassing into China's territory, what Beijing may do next is to get prepared for a military confrontation and resolve conflict through non-diplomatic means." Indian National Security Adviser Ajit Doval's visit to Beijing for a meeting of NSAs from BRICS countries may be key to ease tensions between India and China over the military standoff in Dokalam, a Chinese analyst was quoted by the Press Trust of India as saying.